The Fireback Bed Bug & Insect Spray & Jet can features a dual spray and straw applicator. This double-strike applicator delivers the flexibility you need to target the pests you can see — and also destroy the pests hiding in cracks and crevices. The permanently attached, hinged flip-up straw reaches listed pests hiding in cracks and crevices. Flip the straw back down to expose the opening for a normal spray. 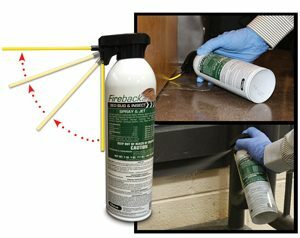 You can still count on Fireback’s ability to kill 29 listed pests and leave a three-month residual, but now it’s easier than ever to get the job done, the company says.